World War I caused much grief, tragedy and dramatic political changes across the world. Palestine as a land and people, however, was the major victim and suffered grave affliction and harm that touched its holy sites and history and conspired against its future. It is the sole living witness of that war today. More than one century later, the world stands paralysed in the face of the suffering of Palestine which is being crushed by the injustice of Israeli occupation. Israel has not implemented a single resolution out of 705 issued by the UN General Assembly and 86 by the Security Council regarding the Palestinian cause, and is backed by major world powers, most notably the United States. According to official Palestinian figures, Israel occupies more than 85 per cent of “historic Palestine” which is some 27,000 square kilometres. The Palestinians are left with only 15 per cent of these territories. Currently, Israel has security and civil control of 60 per cent of the West Bank; 23 per cent is under Palestinian civil control, while Israel maintains full security control; and the Palestinian Authority fully controls 18 per cent of the remaining areas in the West Bank. 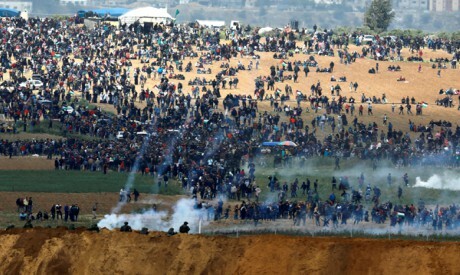 Meanwhile, the Gaza Strip has been under a stifling Israeli military siege by air, land and sea since 2006, and is suffering from poverty, unemployment and deteriorating living conditions. Saneya Faisal Al-Husseini, political science professor at Jerusalem University, Palestine, tells Al-Ahram Weekly that Palestine’s tragedy began in the Sykes-Picot Agreement in 1916 which divided The Levant territories and tore up their political, geographic and demographic connectivity. The following year, the British government issued the Balfour Declaration that granted Jews a homeland in Palestine. “Although the Balfour Declaration did not stipulate any commitments or legal consequences, Britain worked on ‘legalising’ it by including it in the decisions of international conferences and treaties. It also worked on applying the declaration on the ground during the years of colonisation and mandate in Palestine,” explained Al-Husseini. She added that before and after the mandate, Britain opened the doors of Palestine to foreign Jewish immigrants, and thus changed the country’s demography. It enabled them to maintain control through force, and the number of Jews in Palestine rose from five to 10 per cent between 1918 and 1922. By the end of the mandate in 1948, they accounted for 35 per cent of the population. According to this Palestinian academic, Israel references the Balfour Declaration to prove its right and legal connection to Palestine. The League of Nations transformed the Balfour Declaration from a unilateral message without any international legal status to an official international document when it put it in the introduction of the mandate and approved its implementation. Al-Husseini said that the plot to fabricate Israel began with fraud and conspiracy, exploiting the weakness of the people in the region and their lack of will at the end of Ottoman rule, with most countries in the Middle East coming under colonial rule. The Jews declared their state based on UN Resolution 181 issued by the UN General Assembly 29 November 1947. Known as the “Partition Resolution”, some 33 countries approved, 13 objected and 10 abstained. The General Assembly of the then 57-country UN also recognised Israel in 1949. Most of these nations were under colonial rule and no Third World countries had gained independence yet. Resolution 181 stipulates the end of the British mandate in Palestine and partitions the country into three areas — the first for the creation of an Arab state “on an area of around 11,000 square kilometres; second, a state for Jews on an area of 15,000 square kilometres”. The partition plan stated that Jerusalem, Bethlehem and surrounding areas would become territories under an international mandate. The resolution gave Jews a state on 56.5 per cent of historic Palestine, while the Arabs who accounted for more than 67 per cent of the population and owned most of the land were only given 43.5 per cent of the same. The resolution was met with “vehement rejection by Arabs”. Although the resolution was an injustice to Palestinians, as described by international law experts, it was never applied on the ground. Decades later, it is forgotten and no one is asking for its application. Not even the Palestinians who are only demanding a two-state solution in territories occupied in 1967. Al-Husseini said that since the creation of Israel, there have been consecutive calamities not only for Palestinians but Arabs in general, with Western support led by the US today. The Arabs were defeated in the 1967 War in which Israel not only occupied what was left of Palestine but also territories in neighbouring Arab countries, some of which remains under occupation today. Al-Husseini explained that the occupation state used the peace process with the Palestinians to guarantee its continued security control over Palestinian territories and ensure their political and economic dependence in order to unburden itself from being a direct occupation force. Israel allowed Palestinians to practise some form of self-governance and maintained a superficial partnership with them. She continued that passing a recent law on Jewish identity reveals Israel’s true intentions towards Palestinians inside the “Green Line” who are the original natives. It also clearly explains its policies in the occupied Palestinian territories, including settlement building and the Judaicisation of Jerusalem. The law denies any connection between the Palestinian people and their homeland by limiting the right to self-determination in Palestine to Jews only. It also views West Bank territories, including East Jerusalem, as part of “Israel’s land” without defining the term. It also rescinds the right of return for Palestinians. According to Israel’s Central Bureau of Statistics, Israel has a population of 8.8 million, 74 per cent or 6.5 million of them are Jewish and 21 per cent or 1.8 million are Arab Israelis, also known as “1948 Arabs” who did not leave their homes when Israel was created in 1948. Salah Abu Hatab, a Palestinian writer and political analyst, believes that the repercussions of World War I and the fall of the Ottoman Empire was a dramatic shift in the geostrategic layout of eastern Arabia which stretches over Greater Syria (Syria, Lebanon, Palestine, Jordan) and Iraq. Palestine was the key point of alliance between British imperialism and the Zionist colonial movement through the Balfour Declaration. He continued that the Palestinian cause passed many crossroads since the 1948 war, including the June 1967 War, or Six Day War as Israel refers to it, which reflects its arrogance and conceit about its superiority over Arabs and forcing them to accept UN Resolutions 242 and 338. These resolutions guided political action on the Palestinian cause for decades to come. Some even believe they were the start of Arab recognition of Israel as a state that has the right to exist in the region. Security Council Resolution 242 issued on 22 November 1967 followed the third Arab-Israel war in June 1967 in which Arab armies were defeated and Israel occupied new Arab areas. Resolution 338 was issued on 22 October 1973 calling for a ceasefire on all fronts of the October War and implementing all parts of Resolution 242. According to Abu Hatab, there were major events in the 1970s and 1980s on the regional and international arenas with the collapse of the Soviet Union in 1989, the Iraqi invasion of Kuwait in 1990 and rise of the US as leader of a unipolar world order. These dramatic developments served Israel’s interests and placed the PLO in a very complicated and difficult position. The PLO was only saved by a gift from the Palestinian people in the occupied territories — the first Intifada of 1987. When everything reached critical mass, it led the way to a peace process which resulted in the 1993 Oslo Accords. Oslo was a crossroads that took the Palestinian cause down another path. It was the main cause of a serious fracture in Palestinian ranks and triggered the rise of Islamist groups that opposed the agreement and conciliation with Israel. Oslo, officially named the Declaration of Principles on Interim Self-Government Arrangements, is a peace agreement between Israel and the PLO signed in Washington on 13 September 1993. It was named after the Norwegian capital where secret talks began in 1991. The Oslo Accords stipulate the creation of a Palestinian state by the end of 1999, which has not yet happened while Israel continues to build Jewish settlements on West Bank territories, including Jerusalem. Palestinian statistics show there are more than 670,000 settlers, including 220,000 in Jerusalem, living in 127 settlements and 116 unlicensed random settlement clusters in the West Bank, and 15 settlements in occupied East Jerusalem. Abu Hatab argued that Israel cleverly manipulated the agreement and involved Palestinians in direct Israeli control of the territories, by blackmailing Palestinians into making more and more concessions, which ended Palestinian liberation rhetoric and led to amending the National Palestinian Charter on 14 December 1998. It removed romantic revolutionary idealism from its lexicon which triggered division between Fatah and Hamas — the two largest factions — in June 2007. Despite the upper hand of Israeli occupation, a report by the Palestinian Centre for Policy Research and Strategic Studies (Masarat) noted that Israel’s immense forces cannot obscure several truths, including that after 70 years of its creation Israel has not accomplished its Zionist project despite making great strides. The Zionist slogan is “a people without land in a land without people”, but this has been debunked despite the many victories, wars and massacres by Israel. The Palestinian Bureau of Statistics shows that the number of Arabs has multiplied seven and a half times since the Nakba (1948). This caused Zionism and Israel to change their plans, even if only tactically, from creating Israel on the promised land to include at minimum historic Palestine from the river to the sea and at most from the Nile to the Euphrates. Now, they accept the existence of the Palestinian people in the Oslo Accords, and accept the creation of a Palestinian state. And since 1993, the conflict has evolved around the area, borders, sovereignty and capital of the Palestinian state, and how it can remain an “Israeli protectorate”. Abu Hatab said the second truth is that Israel has existential anxiety because the resistance, especially Palestinian which has not abated since the Zionist invasion even though it ebbs and flows, swings between military battles and a people’s war or uprising. Sometimes it is Palestinian Arab and at others it is Palestinian, but at all times resistance continues. According to Masarat, the plan by US President Donald Trump’s administration to settle the Palestinian conflict, known as “Deal of the Century”, was stymied due to Palestinian, Arab and international rejection. But it has not been defeated yet, and is being implemented on the ground in the hope that it will be approved once it is accepted as a fait accompli, including creating a new reality in Jerusalem, rescinding the right of return, legitimising and expanding settlements, gradual normalisation with Arabs, isolating Gaza and preventing the creation of a Palestinian state within the 1967 borders. Trump’s rise to power compounded the Palestinian crisis, and his administration issued a series of quick and fateful decisions that are detrimental to the Palestinian cause. These include recognition of Jerusalem — both East and West — as the capital of Israel; relocating the US embassy from Tel Aviv to Jerusalem; ending funds to UNWRA and the Palestinian Authority; and shutting down the PLO office in Washington which served as a Palestinian embassy. Leaks to the media inside and outside Israel reveal that the US plan is gravely biased against Palestinian rights, since it accepts most Israeli settlements in the West Bank and eliminates the right of return for Palestinians. It also takes the issue of Jerusalem off the negotiating table.